The IHS E-Newsletter, launched in February 2015, is free to anyone, IHS member or not. For members, it complements The Horn Call; for non-members, it is a glimpse into content you can expect in the journal and may tantalize you with its links into members-only content. Those who subscribe receive approximately monthly issues by email with personal stories, educational content, and horn-related articles and links. Articles by hornists around the world will be in their language (as well as, in most cases, English translations). Content will include video and audio tracks, announcements for events, and horn trivia. Email us with your suggestions. Sign up to receive the newsletter; you can unsubscribe at any time. If you are an IHS member or have a user account for IHS Online, log in to your account first so your member information is recognized and appears in the form automatically. You asked for it. Here it is! 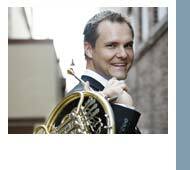 Welcome to the first issue of an exciting and free digital newsletter from the International Horn Society. We’ve put together a great mix of information about horn events, performers, performance, pedagogy and more. This month we are proud to give you Javier Bonet speaking about the Natural Horn and Gallay, Annie Bosler sharing upcoming highlights for IHSLA 2015, and I share my favorite exercise for soft playing and more. We will be featuring different countries around the world, and as many different horn related topics as possible. If you have any suggestions, please email me. Pass this newsletter along to all your friends. It’s free, and they don’t have to be a member of IHS to sign up. Your friends can sign up at http://www.hornsociety.org/newsletter. We will be adding valuable content to the IHS Members Section too, so hopefully you and I can inspire more people to join us this year. Hosted by Andrew Bain and Annie Bosler, the 47th International Horn Symposium takes place at the Colburn School in the heart of downtown Los Angeles from August 2 - 8, 2015. I had a chance to chat with IHS LA 2015 co-host Annie Bosler about the upcoming week. Check it out! Jeff: How did you arrive on this year’s theme? Annie: This year's theme, “Then and Now," is a celebration and reflection of the horn's role across time. The theme was Andrew Bain’s idea and very fitting for an event of this kind in Los Angeles. The last IHS workshop was held in LA in 1979, so it has been 36 years since masses of horn players have gathered in LA. There are many great lectures and recitals planned around this theme! In addition, we plan to showcase the role of the horn in a city rich in film music history. Jeff: What are some highlights of the week? Annie: Wow! Well there is so much going on it is hard to pick some highlights. The Grammy Award Winning Big Phat Band featuring Richard Todd and Arkady Shilkloper along with special guest Stefan de Leval Jezierski will kick off the week at the opening ceremonies. Andrew Bain will perform several new commissions for horn. Live Horn Hangouts with Sarah Willis! Solo Performances by Radek Baborák, Gail Williams, Stefan Dohr, James Thatcher, Tim Jones, Richard Todd, Andrej Zust, and more! The horn sections of the Berlin Philharmonic, New York Philharmonic, Los Angeles Philharmonic, and American Horn Quartet will all be in the same place at the same time and performing! Ghengis Barbie will be rocking out in a cool venue in Little Tokyo. Hollywood Horn Day on Wednesday, 8/5 is dedicated to the history of horn in Los Angeles. Artists include Jim Thatcher, Richard Todd, and Brian O’Connor. Exhibits open on Monday, 8/3 and close on Friday, 8/7. Fearless Performance class with Jeff Nelsen. A red carpet event recreating a Los Angeles Horn Club Concert at one of the old Los Angeles Broadway Theatres. Expect lots of fun and history! Weekday classes on centering and focus with peak performance specialist Dr. Don Greene. The American Horn Quartet’s Last Concert Ever will be held on Friday, 8/7. Cake will be served afterwards to celebrate AHQ and what they have done for the horn, horn quartets, and chamber music! Concert in Grand Park featuring a new commission for horn and wind ensemble with IHS’ own president Jeff Nelsen and a new commission by Kerry Turner. Early-Bird Deadline - February 28! For more information, check out the IHS LA 2015 website: www.ihsla2015.com and follow IHSLA2015 on Facebook (https://www.facebook.com/ihsla2015) and Twitter (https://twitter.com/ihsla2015)! New content is added to the website daily. The exhibitor list is updated as businesses register, and a full schedule of the week will be available soon! The Barry Tuckwell Scholarship Award deadline is March 15, 2015! Are you planning on attending a horn camp, masterclass or workshop on this planet? Click here to check this out today. Esta serie de sonidos que no están temperados es decir que son simplemente producto del fenómeno físico natural, deben ser modificados artificialmente por el intérprete para afinarlos y llevarlos a ese temperamento que le permita tocar en orquesta o en música de cámara. Además, dado que esta serie no es una escala completa, tenemos que producir artificialmente los sonidos que nos faltan para obtener esas escalas propias del sistema musical tradicional. Los procedimientos para temperar la afinación y completar la escala son básicamente 3. La posición de la lengua en el interior de la cavidad bucal subiéndola y bajándola provocando de esta forma un tama o mayor o menor de esta. Una mayor o menor tensión de los labios que pueden hacer subir o bajar la afinación de las notas, y el más visual de todos aunque no el más importante, la posición de la mano derecha en el pabellón; a mayor introducción de esta en él, la nota bajará su afinación y abrirla provocará el efecto contrario. Este último procedimiento sin embargo producirá un sonido más cerrado o metálico, con un timbre diferente y es ahí donde la pericia del intérprete conseguirá, con la combinación de los otros dos sistemas minimizar esta diferencia de sonido, reservándola para algunos efectos concretos, muy bellos pero de los que no se debe abusar para no convertir las frases musicales en una especie de puzle de timbres diferentes. Javier Bonet's next recording also in Audio and video will be launched in a few months, the Mozart horn music, with modern horn, Münchner Rundfunk Orchester conducted by Hermann Baumann. I always knew I should be doing my long tones, but I just couldn't do them. I’m sure that made for a rougher-than-needed time for me in the past. I very much enjoy doing this exercise. They are basically Long Tones with a Tune. I’ve gained endurance, flexibility, color control, soft playing calmness and abilities, loud playing abilities, smoother slurs, cleaner tongue, and I've gotten over my hesitation in starting first notes. View the video of Jeff playing the exercises. You can now have your IHS membership renew automatically. Just click on the "Recurring Membership" button when you join or renew.